This is the Bohème we have been waiting for, the 1972 Chicago Lyric Opera production, the first to be filmed in colour at the New York Met., in 1977. 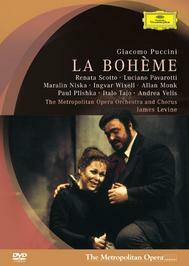 Three decades ago Pavarotti was in his prime, and he makes an ideal Rodolfo, not only singing with his usual vocal charisma, but acting movingly, partocularly in the final scene. Renata Scotto’s Mimì very nearly steals the show.